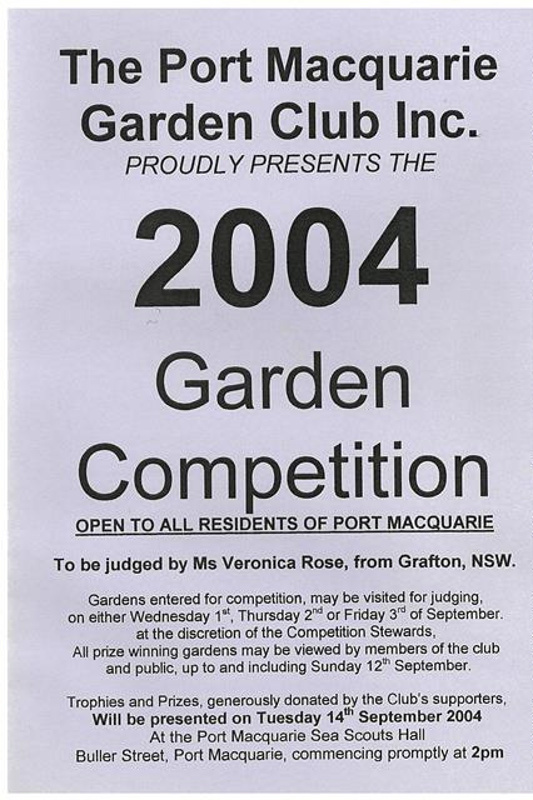 Archives of the Port Macquarie Garden Club [1995-2004] including minutes 2000-2004, correspondence 1996-2002, membership and office-bearer lists 1996-2002, financial records 1995-2004, unused stationery, and Spring Garden Competition correspondence, records, entry coupons, certificates and prize lists. 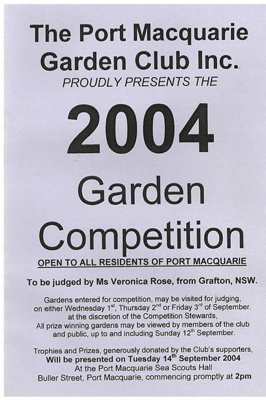 The Port Macquarie Garden Club was formed at a public meeting called by Mayor Ald. A. L Crisp, and instigated by Ald. Mary St. Clair held on 12 November 1962. Mrs M. St.Clair was elected President and Mrs York elected Secretary on a temporary basis. At a further meeting held on 27 November 1962, the following office bearers were elected: President, Mrs. St. Clair; Secretary, Mrs. York; Treasurer, Mrs. I. Keena; Vice-presidents, Mr. Onis Walker and Mrs. Hewens; Committee, Mesdames A. Lewis, G. Warlters, G. Scholes, and Mr. "Mac" McLaughlin.